Bloomberg reports that The Advisory Board Company is considering strategic options – potentially including a sale of the company — following last month’s acquisition of 8.3 percent of its shares by an activist investor. ABCO shares have climbed nearly 50 percent since mid-December 2016, although their one-year performance of 9.6 percent and five-year increase of 29 percent trails the Nasdaq’s 30 percent and 95 percent, respectively. Above is the one-year chart of ABCO (green) vs. the Nasdaq (blue). The company’s valuation is nearly $2 billion. 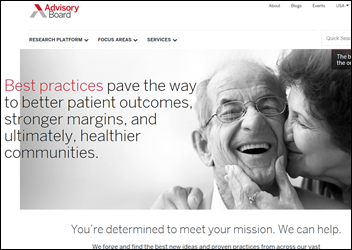 The Advisory Board announced a six percent workforce reduction last month along with its exit of some business lines and the closing of four offices. The company says it will honor its commitment to add 1,000 jobs as required by a $60 million, 10-year tax break offered by Washington, DC to consolidate its offices at a new location in Mount Vernon Square. Hock designed the organization according to his philosophy: highly decentralized and highly collaborative. Authority, initiative, decision making, wealth — everything possible is pushed out to the periphery of the organization, to the members … On the one hand, the member financial institutions are fierce competitors … On the other hand, the members also have to cooperate with each other: for the system to work, participating merchants must be able to take any Visa card issued by any bank, anywhere. That means that the banks abide by certain standards on issues such as card layout. 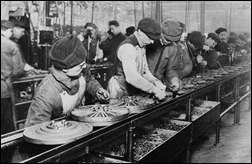 Even more important, they participate in a common clearinghouse operation, the system that reconciles all the accounts and makes sure merchants get paid for each purchase, the transactions are cleared between banks, and customers get billed … No one way of doing business, dictated from headquarters, could possibly have worked. "It was beyond the power of reason to design an organization to deal with such complexity," says Hock. From Banshee: “Re: VitalWare. Site hacked?” Apparently. 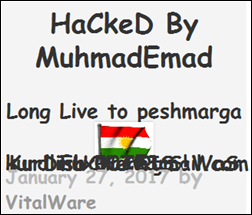 Most horrifying is that hacker MuhmadEmad, who apparently hit a bunch of sites over the weekend as evidenced by Googling the text above, changed the font to Comic Sans. The good news is that his hack seems to consist of just posting an anti-ISIS messages as a WordPress post while leaving the site otherwise intact, which should make recovery uneventful. Since its founding in 2010, Nordic has evolved from its roots as a leader in EHR staffing to not only the world’s largest Epic consulting firm, but a firm with a broad set of KLAS-proven healthcare IT solutions. Featuring nearly 700 consultants, Nordic has organized those experts to solve healthcare organizations’ most challenging health IT problems with carefully crafted solutions. These solutions were developed and refined over the last few years to meet the evolving needs of Nordic’s client partners, including the shift to value-based care, mergers and acquisitions, Community Connect, upgrades, optimization, revenue cycle transformation, analytics, a suite of managed service offerings (including tier 2 application support), and more. At HIMSS17, visit Nordic at booth 903 and RSVP for Nordic’s reception. To learn more, visit nordicwi.com. Bonny Roberts slid down the rabbit hole in 2013 when her “Ode to Mr. H” earned her the preeminent title (and sash) as Mr. H’s Secret Crush. Since then she has contributed a bit to the publication and much to the fervor that is HIStalkapalooza. In preparation for role as greeter on the red carpet, Bonny admits to using her Frontier Airline miles to purchase People, Us, and Star magazine subscriptions. She has also studied Melissa Rivers technique and is diligently practicing the complete opposite. Bonny has worked in the healthcare information technology industry for the past 19 years and is the VP of customer experience for Aventura Software in Denver, CO.
First things first – Barry Wightman published his first novel, Pepperland, a revolutionary, technology, rock ‘n’ roll love story in 2013. The book received a starred review on Booklist, won a Silver IPPY for best fiction from the Independent Publishers Book Awards. 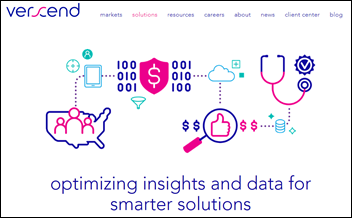 His day job – he’s creative director for Forward Health Group, Inc., a maker of population health measurement platforms and data strategies that drive success in the move to value. Rest of the time – he can still be found with a guitar in hand figuring out the riffs to old Kinks records. Ever since she was a little girl, Julie Yoo‘s lifelong dream has been to emcee the HISsies at HIStalkapalooza. In between grueling rehearsals, Julie oversees the product and business development teams at Kyruus. After February 20, with lifelong aspirations fulfilled, she will shift her focus back to improving patient access one patient-provider match at a time. New poll to your right or here, as suggested by a reader: if you aren’t going to the HIMSS conference, why not? I’m sure I omitted some good reasons in my list of presumptive choices, so I’ve added a space for providing your own answer. 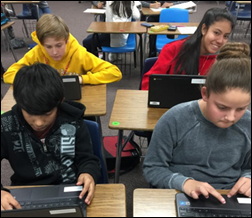 Ms. F from Arizona reports on the Chromebooks we provided in funding her DonorsChoose teacher grant request, saying that most of her students wouldn’t have access to technology otherwise. She is assigning them work on school-approved math programs that can be completed without leaving the classroom. Thanks to the following companies for their recent support of HIStalk. Click a logo for more information. Children’s Health (TX) is fined $3.2 million for repeated non-compliance with HIPAA security standards, including loss of two unencrypted devices. Meditech’s FY2016 financial report shows significant declines in product and overall revenue, as net income has dropped 41 percent since FY2014. OxyContin manufacturer Purdue Pharma gives the State of Virginia a $3.1 million grant to integrate its prescription drug monitoring database with provider EHRs. The source of President Trump’s claim that illegally cast votes cost him a popular vote win is discovered to be Gregg Phillips, chairman of Medicaid eligibility decision support tool vendor AutoGov. Global Health Exchange and Vyne are reported to be exploring selling the companies. A JAMA article finds that providers continue to overcharge patients for copies of their medical records despite specific HHS OCR guidance that addresses allowable costs that can be passed on. Collection volumes were down in Q4 and clients pushed some professional services work back. The company expects to gain business as provider focus shifts away from government-mandated functionality. The company’s Q4 Net Promoter Score of 23.9 fell far short of its target of 44. Jonathan Bush says whatever form repeal-and-replace takes will help the company sell to under-50 bed hospitals that are short on capital. Bush said the company “did very badly” in the group segment because Athenahealth’s fees sometimes exceed user cost savings. The company reported increased integration with Epic and expects that to increase sales to health systems using Epic, Cerner, and Meditech, noting that population health management requires a “fabric that crosses across systems” since most of the doctors involved will never use Epic. Bush says that under HITECH, the company only had to be better than other vendors, while today they have to be “better than doing nothing” since providers won’t buy new systems unless they increase cash. He says the company will be issuing a net patient market share guarantee. 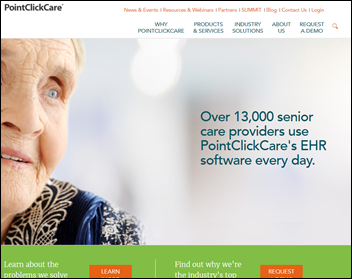 Canada-based long-term care software vendor PointClickCare Technologies raises an $85 million round of funding. Talent management solution vendor HealthcareSource hires Bob Zurek (Scribe Software) as SVP/CTO. Doctor waiting room advertising company Outcome Health, recently renamed from ContextMedia, hires former US CIO Vivek Kundra (Salesforce) as EVP/chief growth officer. 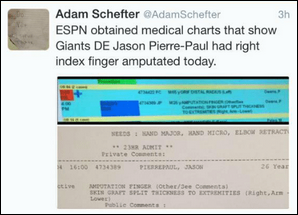 ESPN settles the lawsuit brought against it by pro football player Jason Pierre-Paul, who objected to the network’s tweeting out photos of his medical records indicating that he had blown off a finger while playing with fireworks on July 4, 2015. ESPN maintains that running an illicitly obtained photo of an on-screen surgery schedule describing Pierre-Paul’s amputation – for which two Jackson Memorial Hospital employees were later fired — was “both newsworthy and journalistically appropriate,” calling into question its understanding of both principles. 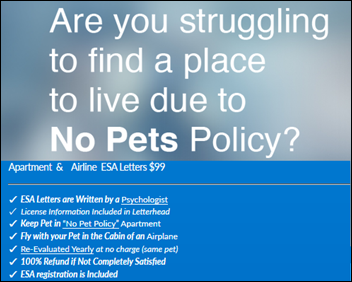 A Los Angeles TV station uncovers the lucrative side business run by a medical marijuana doctor who, for $150 and a quick Skype chat, will sign a letter proclaiming that his customer needs an “emotional support animal.” Airlines are then required to accept the precious pooch (or in some cases, pigs and monkeys) as a main cabin passenger for free. I Googled “emotional support animal” and came up with many examples of people buying such certification to do what they want instead of what is allowed or reasonable. A fired surgical resident is caught participating in medical rounds, attending lectures, and observing surgeries in several Boston hospitals by “tailgating” — entering restricted areas without an ID badge by tagging along with people who helpfully hold the door open for someone who seems to be a co-worker. Hospitals worry that such inherent politeness renders their electronic card systems and security cameras less useful, but are reluctant to install subway-style turnstiles, station guards outside ORs, or implement biometric ID. IT people know that anyone can enter card-protected spaces by simply wearing UPS-like brown shorts and a shirt and walking up to a secure door while holding large packages. 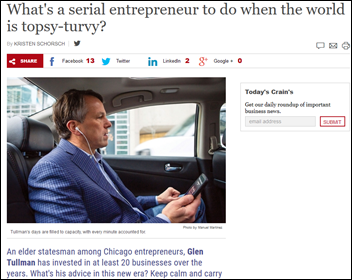 Crain’s Chicago Business runs a lengthy (and a obviously homer-written) profile of Glen Tullman (Allscripts, Livongo), including his political thoughts, investments, and investment style. Apparently he sleeps just four hours per night and bolts down meals to move on to something more interesting than eating with his family. An interesting article explains why the level of fear people have about something (like being killed by a terrorist) is often in disproportion to the likelihood of that happening. It blames the “bleeds it leads” media, click-seeking news reports, and violent movies and TV shows as part of the Mean World Theory, which has led Americans to misperceive that crime rates are high when they aren’t and to ignore known significant but unsexy threats like gun violence and climate change (and as CIO Sean Gilliland notes in his retweet, they are more scared of terrorists than their much more likely but partially preventable executioners, cancer and heart disease). The president of Pakistan’s medical association says that 10 percent of the country’s medical schools are “fleecing the public,” offering low-quality education strictly for profit by owners whose other holdings include sugar mills and textile plants. Fortified Health Security is approved as a HITRUST CSF Assessor. Employer Wellness Programs and ROI — I find the story to be contrary to the very frequent wise and critical eye of HISTalk..the reason I treasure your site. The ROI section only discusses participation, not true ROI or any statistical or credible academic study. Maybe this is because there really are not any…we have been throwing around worksite wellness, tied to technology, for over 20 years, and the only credible results are tied to the programs being an employee-human relations program. Majority of such programs are utilized by the “Worried Well”, and falsely reported (such as the Colorado program) by the HR (non healthcare folks, non academic folks, non scientific folks) or the internal cheerleaders (such as the gentleman quoted). They will spin the program to suite their needs and to make themselves, their employees and their employer feel good about it all. There re many studies published that show these programs DO NOT WORK….and area simply human-relations, internal marketing programs.